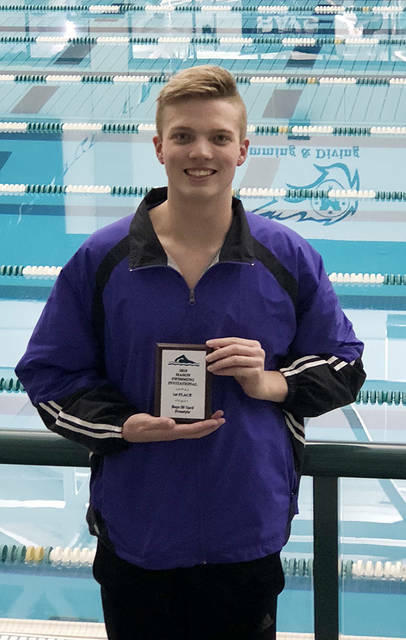 Butler swimmer Matt Brunsky placed first in the 50 free at the Mason Invitational on Saturday. Vandalia-Butler advanced a total of 15 swimmers to finals at the Mason Invitational. Top row left to right: Cameron Tuttle, Matt Brunsky, Khalil Ruiz, Sam Martin, Riley Brady, Eli Neal. Middle row left to right: Katie Bonifas, Jackson Baker, Abbey Burton, Adam Gunckel, Evan Lozan. Bottom row left to right: Rachel Shively, Sydney Aller, Erin Dean, Gwynne Rohde. 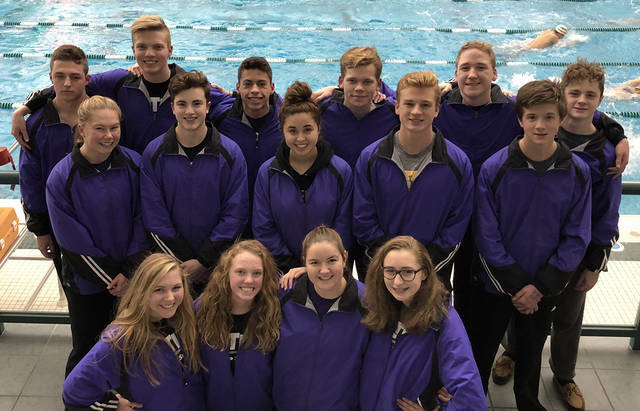 MASON — The Vandalia-Butler Swim Team kicked off the start of competitive season this past Saturday at the Mason Invitational where they competed against 21 different area schools. The boys teams placed sixth overall scoring at total of 117 points and the girls team placed 12th with 48 points. The boys A 200 medley relay of Khalil Ruiz, Sam Martin, Adam Gunckel, and Matt Brunsky advanced to finals where they placed 5th overall, moving up two position from prelims and achieving a time of 1:49.29. Junior Gwynne Rohde had impressive swims in both her individual events. She advanced to finals in the 200 free swimming a personal best of 2:15.64 and placed 13th overall. In the 100 individual medley, senior Abbey Burton competed in the championship heat at finals placing 8th overall with a time of 1:09.59. In the 50 free, sophomore Matt Brunsky advanced to the championship heat of finals where he out swam St. Xavier senior Drew Morstadt for an overall first place finish and a personal best time of 22.84. Junior Cameron Tuttle also advanced to finals in the 50 freestyle where he finished 15th overall with a time of 25.34. The 100 butterfly was the Aviators strong-hold, they qualified 5 swimmers in this event. For the girls team, sophomore Sydney Aller came in 14th overall with a time of 1:09.20, followed by freshman Katie Bonifas in 16th place at 1:11.40. On the boys team, junior Adam Gunckel placed 10th with a 58.14, junior Khalil Ruiz placed 13th at 1:00.30, and sophomore Evan Lozan placed 16th at 1:05.95. Sophomore Riley Brady advanced to the championship heat at finals in the 500 free, where he swam a lifetime best of 5:28.70, taking 8th place overall. The girls A 200 free relay of Rachel Shively, Katie Bonifas, Sydney Aller, and Abbey Burton advanced to finals where they moved up one position finishing 5th overall with a time of 1:50.98. In the 100 backstroke, Khalil Ruiz finished 8th with a time of 1:01.75. In the 100 breaststroke, Katie Bonfias, Sam Martin, and sophomore Eli Neal advanced to finals. In finals, Katie placed 16th with a 1:22.23. Eli Neal finished 15th with a time of 1:13.35 followed by Sam Martin in 16th with a 1:14.53. The final event of the evening was the boys A 400 free relay of Adam Gunckel, Riley Brady, Khalil Ruiz, and Matt Brunsky. They closed out the evening finishing 4th overall at finals with a 3:34.54. Freshmen Katie Bonfias and Jackson Baker were both Swimmers of the Meet by the Vandalia-Butler coaches for their outstanding performances at the Mason Invitational. Bonfias qualified for finals in both her individual events and in the 200 freestyle relay. She achieved lifetime best in all in her swims. Baker advanced to finals as an alternate for both the 100 individual medley and the 100 freestyle. Baker swam an impressive 58.05 in the 100 freestyle, placing him amongst the top 5 swimmers at Vandalia and a 1:06.14 in the individual medley. Congratulations to all the Vandalia-Butler swimmers who competed at the Mason Invitational!! The Aviators travel to Miami University on Friday December 14th where they face opponents Talawanda and Fairfield. The meet is scheduled to start at 6:00pm.